Our Giant Chocolate Easter Egg Raffle is now underway!! We have several Eggs in locations throughout the Park Gate and Locksheath area, so if you see one please buy a number- you might be the lucky winner!! This year we have donated funds from our Christmas 2018 collections to the Hamble Lifeboat, and to Lockswood Day Care Centre. 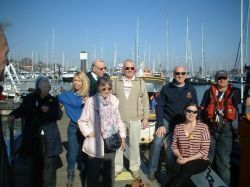 On a beautiful sunny day in late February,we presented our cheque for £1,000 to the Lifeboat crew, at their Boathut on the Hamble. Hamble Lifeboat was formed by Hamble residents in 1968 as the Southampton Water Inshore Rescue Service (Hamble Rescue). This was in response to the number of casualties occurring in Southampton Water and the Rivers Hamble, Itchen and Test, which had increased to 19 deaths in one year. The nature of the area meant something fast, powerful and capable of operating in shallow water was needed. The crew is made up of volunteers who give their time and effort with the very vital support of their families. The Service responds to tasking by the UK Coastguard during weekends, Bank Holidays and pager availability 24 hours a day, 7 days a week, in all weather conditions, and attends on average 100 incidents per year. The average annual cost of running the service is £35,000. Also in February, we presented a total of £1,400 to the Lockswood Day Care Centre. 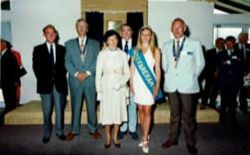 The building was officially opened on 20th June 1996, at a ceremony attended by the chairman of the building committee Lion Vic Smith, the Duchess of Wellington, and other dignitaries, including Lions. Since 2014 the centre has been run by Age Concern, and provides activities for local people who may be physically or mentally frail, to give them a purpose to their week. Activities range from competitions, quizzes and group games to music and movement, arts and crafts, gardening, and computer training. The day care services also provide Carers with well earned respite and support. The garden is used extensively, particularly during the warmer months, and is in need of updating. Our £1,400 donation should go a long way to achieving an improvement. 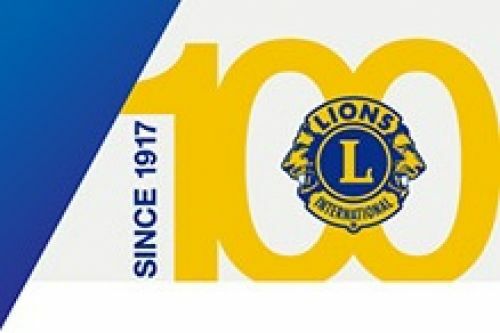 2017 was the Centenial Year for Lions Clubs, as the organisation was formed in Chicago in 1917. Since then, we have grown to be the worlds largest service organisation,with over 47,000 clubs spread over 200 countries. With this subtstantial membership, the organisation is able to carry out many worldwide projects, and provide disaster relief to affected countries. There are active programs in Diabetes,Hunger Relief, Pediatric Cancer,Vision, and the Environment, to name a few. Although Lions Clubs are part of an international organisation, clubs primarily serve their local communities. If you know of anyone who needs assistance, where the official channels may have been exhausted, please contact us- we may be able to help. 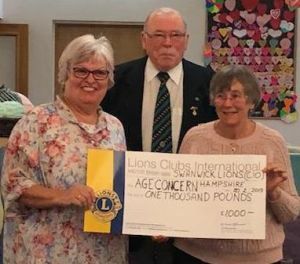 ……….and if you would like to find out more about becoming a member of Swanwick Lions Club please contact us- we will be delighted to talk to you ! !